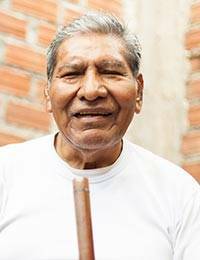 Handcrafted of smooth bamboo, the quena flute is a legacy of the Inca. Today it is an indispensable instrument in traditional Peruvian songs. Benito Tito perforates holes of different widths to ensure a professional sound. An owl adorns the flute and its fabric case emulates pre-Hispanic textiles. 38 cm H x 2.5 cm Diam.